CKUT’s Community News Collective broadcasted live from the Missing and Murdered Women Memorial March on February 14th. Listen to the podcast! THANKS TO UPSTAGE FOR THE RADIO SOLIDARITY FOR THIS EVENT. HOSTS SARAH AND ERIC WILL BE ON SITE CO-HOSTING AND BACK TO UPSTAGE THIS THURSDAY! The first women’s memorial march was held in 1991 in response to the murder of a Coast Salish woman on Powell Street in Vancouver. Her name is not spoken today out of respect for the wishes of her family. Out of this sense of hopelessness and anger came an annual march on Valentine’s Day to express compassion, community, and caring for all women in Vancouver’s Downtown Eastside, Unceded Coast Salish Territories. 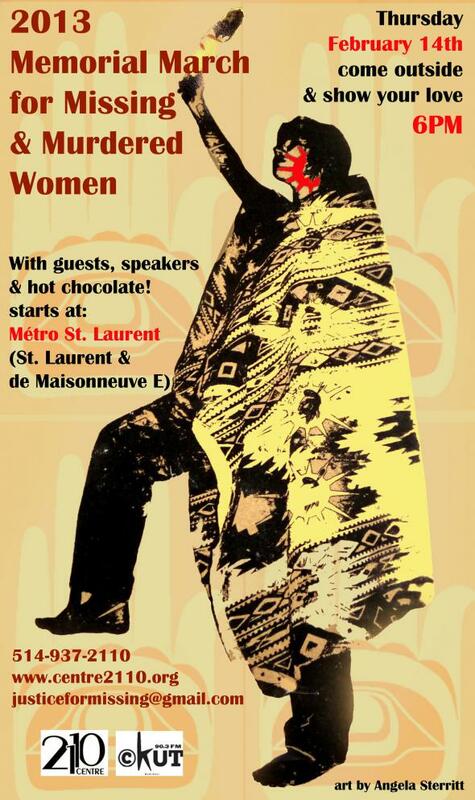 Twenty-two years later, the women’s memorial march continues to honour the lives of missing and murdered women. This year, Montreal held it’s 4th Annual Memorial March.